How to Save Money on Pet CareEliminate The Muda! Buying a pet is a great idea for many reasons. In addition to the joy that they bring, many studies have shown that pet owners live longer. But before you make the decision to buy, you should first consider the financial implications. Whether or not you own a cat, dog, or some other sort of pet, expenses are going to come up from time to time. 1. Search for pet food coupons. At first, I believed this to be a waste of time. But soon enough I began searching online and realized that coupons were available for pretty much every type of pet food and treat. Sometimes I save a couple of bucks on a bag of dog food. Other times I find a really great “buy one get one free” coupon. If you search online and through local periodicals, you will eventually find coupons that can help you save money. When added up over the course of a year, it is easy to look back and realize that I have saved hundreds of dollars. To get a better idea of what is out there, check out these sites: Coupon Cat, Fancy Feast Coupons, Purina, and Pedigree. 2. Buy pet insurance. When you take your pet to the vet, regardless of the reason, you can expect to pay a lot of money. On the low end, a basic checkup will set you back around $75. If something is wrong with your pet, though, the sky is the limit for how high your bill can soar. If you buy pet insurance, you are able to offset some or all of these expenses. If you don’t understand how pet insurance works, think about it like this: it is the same as health insurance for humans. There are things that will be covered, things you will have to pay for on your own, deductibles, and out of pocket limits. To learn more about pet insurance or to purchase a policy, visit: PetInsurance.com, ASPCA Pet Health Insurance, and Pets Best. 3. Shop at the dollar store. This may sound completely crazy, but it is something that saves me a lot of money on a regular basis. I just started shopping at the dollar store for dog-related items last year. I wish I would have thought of this idea sooner. 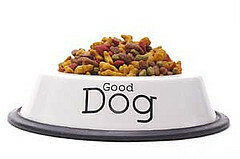 The dog treats are the same as those that you would find at a well known retail or grocery store. Along with this, all of the dog toys cost a dollar. To make this option even more appealing, it seems as if my dog actually enjoys treats and toys from the dollar store more than those that I paid twice as much for. Don’t feel bad if you have overlooked these three tips. To be honest, I never thought much about them for the first few years of owning a dog. Even if you only consider one of the methods above, it is safe to say that you are going to save a lot of money. Do you have any other tips on saving money on pet care? The dollar store is a great idea. My money saving idea is to find your pet at an established animal shelter. Even if you want a purebred they come in and if you put your name in on a request they will call you when there is one you might be interested in. All animals are spay/neutered and current on shots. My little Cinder was a dumpster dog. Someone had abandoned some puppies and they called me the day she came in. Having a dog or cat as a pet can be very expensive. But I agree, owners or parents can save money on their loved ones using pet coupons. Check out the large flea markets also. They usually have a vendor(s) who specialize in pet supplies/food and lots of times they are MUCH cheaper than the stores. In today’s times any savings are worth checking into. Wish those would help me….cats are on prescription food from the vet, too old for insurance, and we don’t need any toys right now! Have you had any luck with pet insurance? I am actually looking to do an article on it because I am not sure if you will save money using it or not. Just curious–thanks! Amanda, we have medical insurance on both our dogs. We decided to take this step after a couple of unexpected visits. I think they get better care than humans. Great tips. Pet insurance is one thing I keep meaning to take a look at but never seem to get around to. I have two dogs and I am amazed at how much we spend on them! I am always looking for ways to save money! I also would love to write about this on my blog and link you? Let me know if that would be ok! I am an owner of a professional pet sitting biz. I would NOT buy pet products at the Dollar Store. Most if not all of what you will see is made in China. I would not buy any edible foods for myself or my beloved cat from China. Secondly, the other pet products are shoddily made, will splinter or break easily and could cause harm to your pets. I agree with Elizabeth. Check your pet food, treats, and toys – avoid things made in China! Not only is it unsafe, but you’ll end up with higher vet bills down the road. Our neighbor’s dog had cancer and the vet warned her of these products. I can buy lots of junk food for me at the Dollar Store and even though it will taste great, it won’t be good for me.